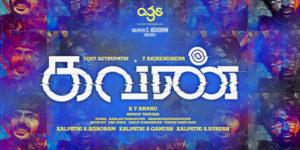 Kavan is a social thriller film directed by K.V.Anand written by Subha. INOX: Vishaal De Mall 11:50 AM; 03:15 PM; 03:25 PM; 06:45 PM; 06:55 PM; 10:15 PM. Jazz & Arsh 10:30 AM; 02:30 PM; 06:30 PM; 10:15 PM. Mani Impala Multiplex A/C 10:30 AM; 02:15 PM; 06:15 PM; 10:15 PM. Thanga Regal Cinema 10:30 AM; 02:15 PM; 06:15 PM; 10:15 PM. Tamil Jaya Cinema 10:00 AM; 02:00 PM; 06:00 PM; 10:00 PM.